With the cost of living going through the roof, now is the perfect time to review your credit card spending. Home Credit Card Manager lets you group and sort the information on your credit card statements showing you exactly where you are spending your hard-earned money. Great for the monthly budget, creating yearly summaries and weeding out bad debt. Try it free today and see how easy it is to manage your credit card expenses! Credit Card Software - How Do I Use It? Enter your credit card statements into the software, either manually or using the import wizard. Match your credit card transactions to the categories provided - Home Money Manager's unique "auto-matching" tool does most of the work for you in seconds! Run the reports to get an instant picture of your credit card spending habits, statement-to-statement and year-to-year. If you have multiple credit cards you can view a grand total over all of your accounts by selecting the "Include All Accounts" option. The Yearly Comparison Report lets you compare totals between two years. The Statement Comparison Report lets you compare totals between two statements. When you are done you can print any of the reports by clicking on the print button. Credit Card Software - What Does It Do? Credit card statements provide you with a wealth of information on where your hard-earned money is being spent. Unfortunately all too often we just glance over them looking for the outstanding balance and then file them (or worse still they go in the bin). Where am I spending all my money? Which expenses can I cut back on? Are all these credit card transactions mine? How much of this credit card total is due to bills? or groceries? What am I spending more on this year, compared to last year? It's free to download, easy to use, and you will soon find out where all your money is being spent. Download this credit card software now and see for yourself. Just 5 to 10 minutes once a month is all it takes to stay in control. Great for six-monthly and annual summaries. Perfect for monitoring your credit card spending. Free to download, easy to install and easy to use. Ability to manage multiple credit cards and transaction listings. Home Money Manager's unique "Auto-Matching" tool does most of the work for you. Import Wizard to load your credit card transactions electronically. Category wildcards and intelligent "auto-matching". Load current and historic statements. "Auto-Fill" on transaction descriptions making manual transaction entry quicker. Detailed reporting including Statement Comparisons and Year To Date Figures. 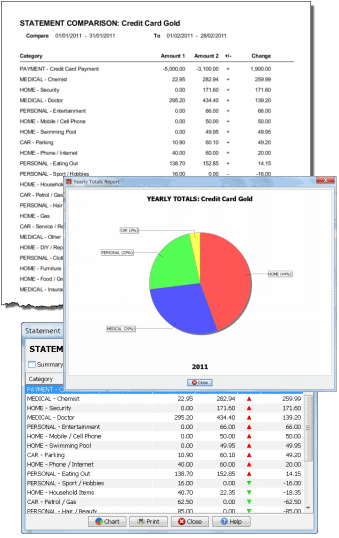 Print option on Reports and Category Totals Screen. Sample workbook and suggested exercises to get you started. Security - Is My Credit Card Information Safe? Home Credit Card Manager is installed locally on your machine allowing you to work in the privacy of your own home. All workbook files containing your credit card information are also stored on your local machine. Home Credit Card Manager allows you to password protect your information. The most sensitive information is your credit card number. We strongly recommend that you DO NOT enter your credit card number anywhere in Home Credit Card Manager (to avoid it falling into the wrong hands). We recommend you use the account name and type of credit card to identify each account (for example, Mr M Citizen - Gold Credit Card). If you share your machine with others, then they may have access to your information. You can reduce this risk by password protecting your workbooks. Home Credit Card Manager is digitally signed with Home Money Manager's 2048-bit Code Signing Certificate (Microsoft Enhanced Cryptography Provider 1.0) guaranteeing that what you download comes from us. This product contains NO malware, adware, spyware, viruses, trojans or backdoors. Credit Card Software - What Next? Download and install the software, take a look at sample workbook and suggested exercises, and discover what this software can do for you. The sample workbook contains an account, statements, transactions, categories and wildcards all set up and ready to go.